Quick Ship Bleachers, 21 Foot 3 Row Aluminum Tip and Roll Bleacher, 332 lbs. This quick ship Tip and Roll 3 row bleacher is in stock and ready to ship in time for your event! 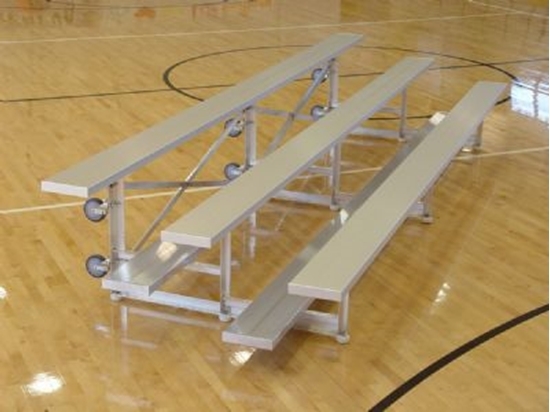 Our 21 ft. bleacher is constructed of anodized coated aluminum for resistance to harsh weather. Portable design with wheels for convenience. Features 2" x 12" anodized aluminum seat planks and 2" x 10" foot planks. Need commercial grade outdoor furniture fast for a big event? Call us to get a quote on Quick Ship Outdoor Furniture from Park Tables. Quick Ship 6 Foot Rectangular All Aluminum Picnic Table, 103 lbs. Quick Ship 38" Square All Aluminum Picnic Table, 117 lbs.